Look at you celebrating your 60th birthday! Have fun letting family and friends know that turning 60 is nothing to worry about by wearing the 60 and Sensational Deluxe Rosette Ribbon. 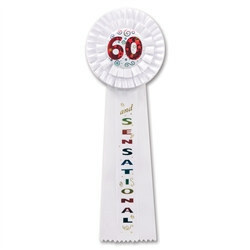 The 60 and Sensational Deluxe Rosette Ribbon is a fun birthday accessory to give to a friend or family member turning 60. The 60 and Sensational Deluxe Rosette Ribbon is a white ribbon that is decorated in colorful lettering to spell out "60 and Sensational." The 60 and Sensational Deluxe Rosette Ribbon does have a attached pin. Decorate party tables with the colorful 60th Birthday Confetti.